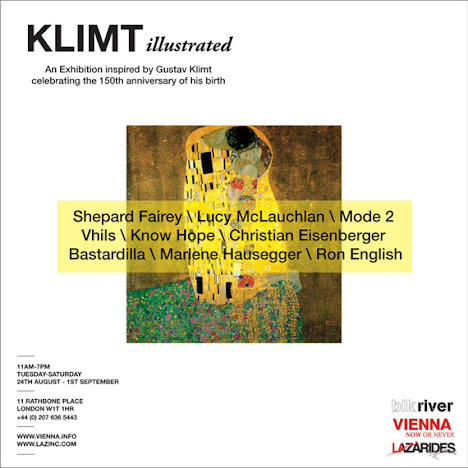 Nine internationally-renowned street artists will produce Klimt-inspired masterpieces which will be displayed in the famous Lazarides Gallery in Soho as a public exhibition, ‘Klimt Illustrated’ to celebrate the 150th birthday of the famous Viennese artist. Artists involved in the show include: Vhils, Mode2, Ron English, Know Hope, Lucky McLauchlan, Christian Eisenberger, Bastardilla, Marlene Jausegger and Shepard Fairey. The show opens to the public on the 24th August 2012 at Lazarides Rathbourne Place gallery. he show will run from the 24th August to the 1st September, Tuesday through Saturday 11am to 7pm. More info can be found on the gallery website.